It's not exactly the same as having an Echo. Let’s be clear up front: The Acer Spin 5 is not a bad laptop. You could justifiably buy it simply because it’s a solidly built convertible with respectable specs for the money, plus a comfortable keyboard and trackpad (not a guarantee in this price range). You might also be intrigued by its Amazon Alexa integration. If you already have Echo products in your home, the Spin 5 would fit right in, but that's actually a minor selling point. 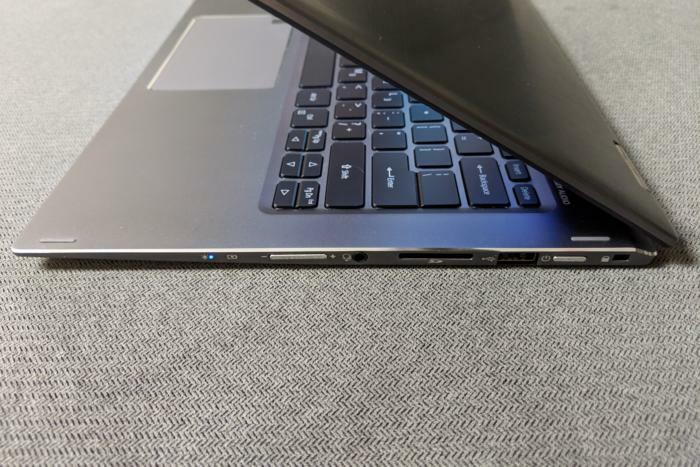 This convertible laptop has a couple of nettlesome downsides, including a noisy fan and thick display bezels, that you'll want to consider before buying. 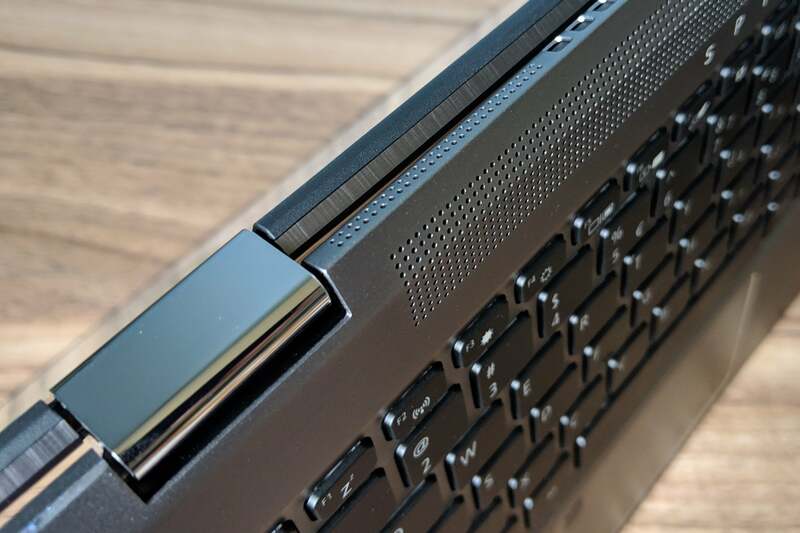 The Spin 5 configuration we tested (SP513-52N-85LZ) lists for $900 on Amazon and includes an 8th-generation Intel Core i7-8550U processor with UHD 620 graphics, 8GB of DDR4 RAM, and a 256GB SSD. Opting for a Core i5-8250U quad-core processor instead brings the price down to $700 on AmazonRemove non-product link (for the SP513-52N-58WW). Both versions include a 13.3-inch IPS touchscreen at 1080p resolution. Acer also sells a version of the Spin 5 with a 15.6-inch display, which allows you to throw in an Nvidia GeForce GTX 1050 graphics card. A version with 8GB of memory and a 1TB hard drive (the SP515-51GN-83YY) is currently $900 on AmazonRemove non-product link. The Acer Spin 5’s nondescript nature starts with its appearance. While the laptop has a polished metallic finish on the cover, under the shell it’s a more drab, matte finish (albeit one that fends off palm and fingerprint smudges). The laptop is on the heavy side at 3.31 pounds, but that does help give it a sturdy feel, and it’s reasonably slim at 0.63 inches throughout. Acer’s Spin 5 gets the brushed-metal treatment, but only on the outside. As a convertible laptop, the Spin 5’s display can rotate 360 degrees, effectively turning it into a large tablet with the keyboard hanging from its underside. You can also tilt the screen partway toward you in tablet mode, or stand it up in “tent mode” with both edges facing down. The downside to this flexibility is that the screen wobbles when you tap on it. While other thin-and-light laptops have started fitting larger screens in smaller bodies, the Spin 5 hasn’t caught on yet. Its top bezel measures about 0.88 inches vertically, and the size bezels each measure a little over a half-inch horizontally. Like other convertibles the Spin 5 has a large chin beneath the screen, running about 1.5 inches to the bottom of the case. All of this adds up to a screen that feels claustrophobic given the size of the laptop itself. The Spin 5 in “tent mode,” thick bezels and all. That said, the actual screen is an IPS panel that provides excellent viewing angles from side to side. It gets a little dim only when viewed from up high. The keyboard and trackpad are the Spin 5’s best features, even if they’re not perfect. The trackpad is large enough to scroll around comfortably, and has well-defined edges so it’s clear when you do run out of room. While it’s not covered in glass, it still feels smooth and precise, plus it offers four sensitivity levels so you can fine-tune the feel of tapping and right-clicking. The trackpad also offers plenty of customization features, including three-finger and four-finger taps that you can map to things like switching apps, switching desktops, adjusting volume, and launching Cortana. The only downside is for folks who like to press down on the trackpad to click: It starts to feel pretty stiff as you move higher up the trackpad. The Spin 5 features a nicely sized trackpad and comfy keyboard, save for the cramped arrows and Page Up/Down keys. As for the keyboard, the chiclet-style keys produce a quiet but satisfying snap with a moderate amount of travel for an ultra-thin laptop. I took a typing test and managed 94 words per minute, versus 103 words per minute on the mechanical keyboard I use every day. I only wish there were more than one level of backlighting, and that the dedicated Page Up and Page Down keys weren’t so uncomfortably close to the left and right arrows. Even mapping them as alternate functions on other keys would have been preferable. Amazon Alexa support is supposed to be one of the Spin 5’s standout features. Through the built-in Alexa app, you can either press a button or just say “Alexa” to begin a voice command, like you would on an Echo speaker. Not that you’d often want to. For one thing, Alexa responds only when the computer is powered on, making it less useful than an always-listening Echo. It’s also about a second slower to respond than a proper Echo device. On occasion I had trouble getting it to respond at all. The Windows version of Alexa has some limitations as well: It can’t play music from third-party services like Pandora, and it can’t send messages. And with Alexa now available on any Windows PC, it’s effectively been reduced to bloatware on the Spin 5. Besides, Alexa just doesn’t sound great on the Spin 5’s so-so speakers. Despite the Dolby Audio branding on the laptop’s inner case, audio playback sounded a bit sharp, and not significantly better or louder than the speakers on a high-end phone. Acer makes a big deal out of the Spin 5’s multidirectional speakers, which wrap around the laptop’s rear edge so they’re not covered up in tablet mode, but you wouldn’t really want to watch a movie on this device anyway. Comparing the Spin 5’s music playback to a 2017 iPad Pro’s, Apple’s tablet is miles ahead on loudness and bass response. Still laptop speakers after all, even with the fancy wrap-around grille. 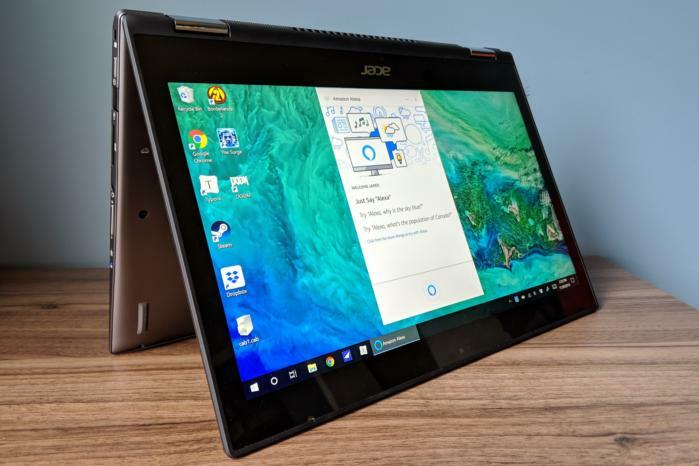 Beyond Alexa, Acer has pre-loaded the Spin 5 with plenty of other programs with varying degrees of utility. There’s the obligatory third-party anti-virus software (in this case, Norton, which takes the liberty of auto-installing its own Chrome extension), App Explorer (“a customized collection of the best Windows apps”), various card and parlor games, CyberLink’s PhotoDirector, and some popular programs like Netflix and Evernote. It’s about level of bloatware you’d expect from a non-Signature Edition laptop. 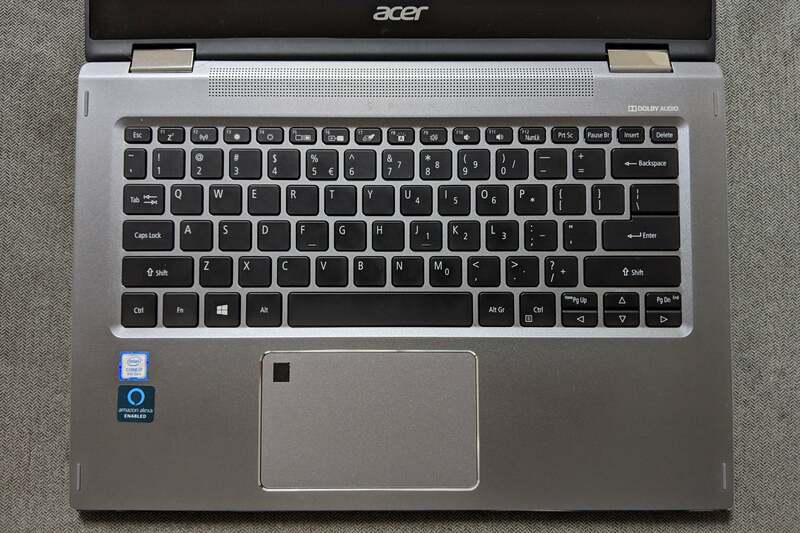 Acer: not betting the farm on USB-C yet. Give Acer credit for this much: The Spin 5 has no shortage of ports. 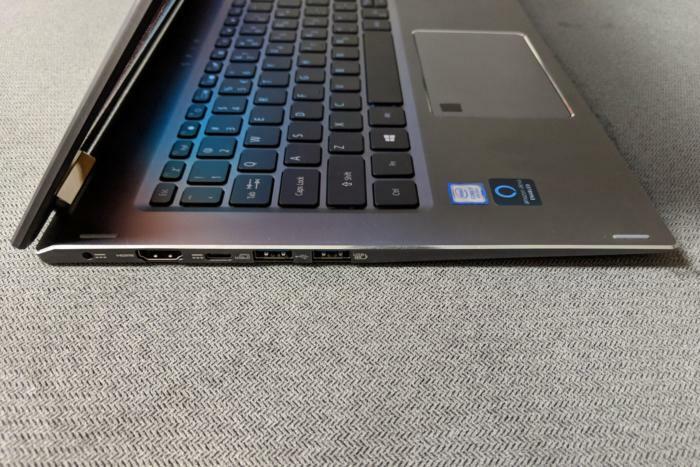 On the left side, there’s a charging port, a USB-C port (which supports DisplayPort output), and two USB 3.0 Type A ports (one of which can charge an external device with the laptop powered off). On the right, there’s a Kensington Lock Slot, a USB 2.0 Type A port, a full-sized SD card slot, and a headphone jack. The lack of HDMI and ethernet isn’t a surprise given the slim design. All the ports you can handle (except ethernet). Acer also included a fingerprint reader on the upper-left corner of the trackpad, and it worked most of the time in my experience. There’s no Windows Hello face recognition, though, and the front-facing webcam tops out at 720p. My only gripe here is that Acer doesn’t offer USB-C charging, so you’ll always have to take the proprietary charger with you. I was able to power the Spin 5 with another laptop’s USB-C charger, but performance took a noticeable dive when it was plugged in. 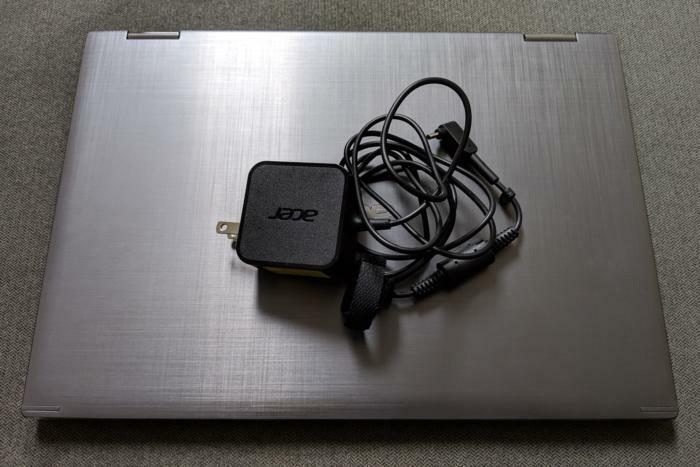 A smartphone charger didn’t power the laptop at all. Acer doesn’t recommend attempting to charge the Spin 5 with USB-C.
No USB-C charging means bringing this power brick plus your phone charger on trips. In my anecdotal experience, the Spin 5 did a fine job with lots of open browser tabs and productivity software. It can also just barely eke out some older 3D games (such as Borderlands 2) at 720p and 30 frames per second. Unfortunately, the Spin 5’s thermal design has some serious downsides. On a table or desk, the Spin 5 becomes a white noise machine when the fans are on full blast, which can happen when the laptop is dealing with several bloated websites, trying to play a game, or even just downloading games from Steam. On a lap, it’s even worse, with the Spin 5’s bottom-facing fans firing a steady stream of hot air directly into your thigh. Acer may have been unwilling to let the edges of the device run too hot. 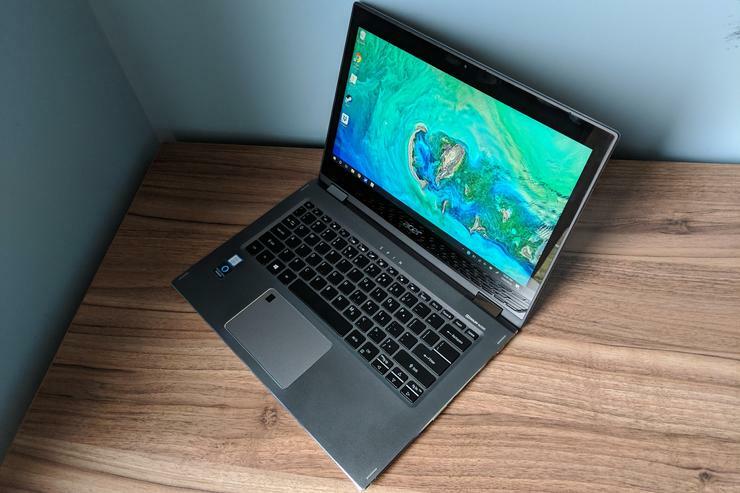 The Acer Spin 5’s performance results reflect this give-and-take between its high-end Core i7 mobile processor, its integrated graphics, and its thermal considerations. The Acer Spin 5 clearly takes it easy on performance tests to avoid stressing the system, which is why its scores sits midrange among similar competition. 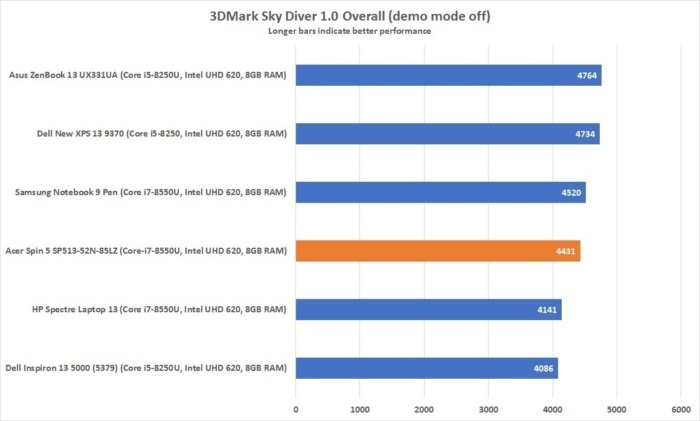 On 3DMark, which tests graphics performance, the Spin 5 falls right in between a pair of similarly configured laptops. Some Core i5 laptops actually fared better in this test, which again may come down to thermal design. The HandBrake test stresses the CPU and can cause heat issues. The Acer Spin 5 posted a solid midrange score here. 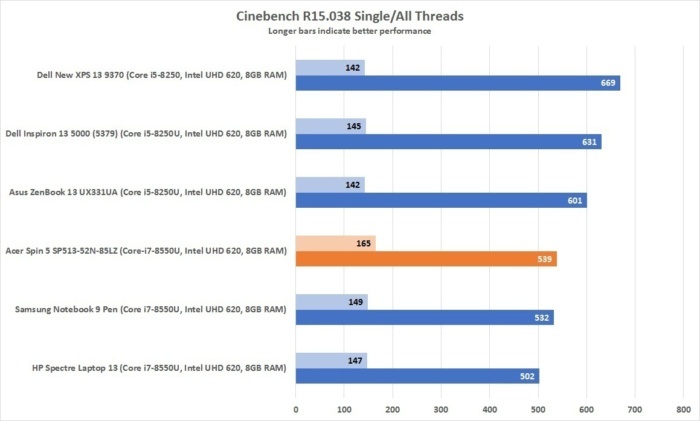 Cinebench measures 3D performance of the CPU alone. 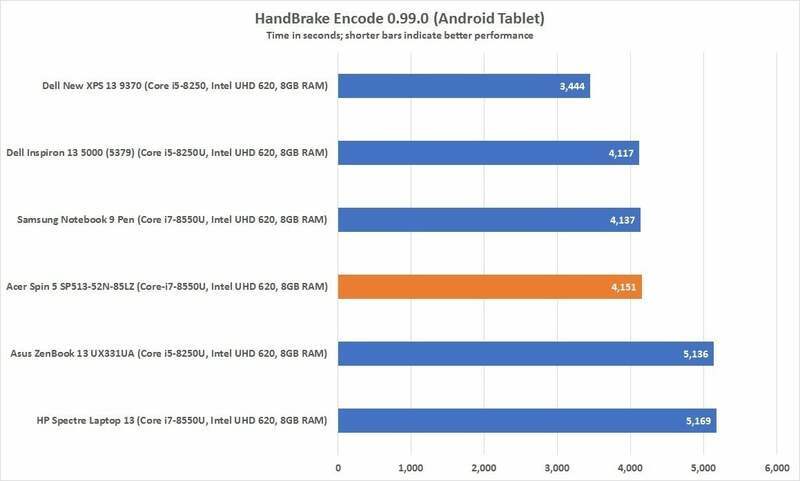 We tested it both single-threaded, with just one processor core; and multi-threaded, taking full advantage of the multi-core/multi-thread capabilities of todays’s CPUs. Why are three Core i5-8250U laptops beating three Core i7-8550U laptops (including the Acer Spin 5) in Cinebench? Likely due to choices the vendors made in how to manage thermals. Cinebench shows how laptops that look the same on paper can perform differently depending on how vendors tune the components.For a convertible like the Acer Spin 5, and also super-thin models like the HP Spectre 13, thermal moderation may take priority over performance, regardless of how high-end the components are. 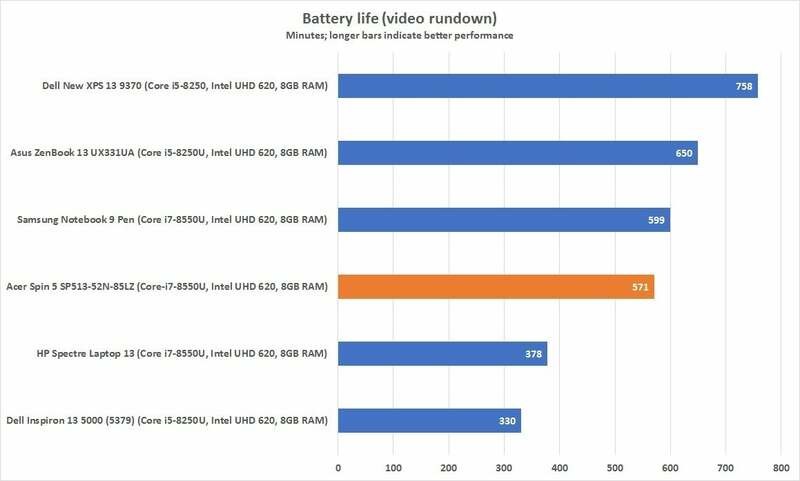 Finally, we have the battery test, where we loop a video continuously until the system dies, with brightness set at an office-comfortable 250 nits. The Acer Spin 5 looped a video for 9.5 hours (at a mid-level 250 nits’ display brightness) before giving up, a good duration. Acer’s Spin 5 managed to run for about 9.5 hours, a good result. Don’t be surprised if battery life is a few hours less than that in normal, online use, though. Should you buy the Acer Spin 5? 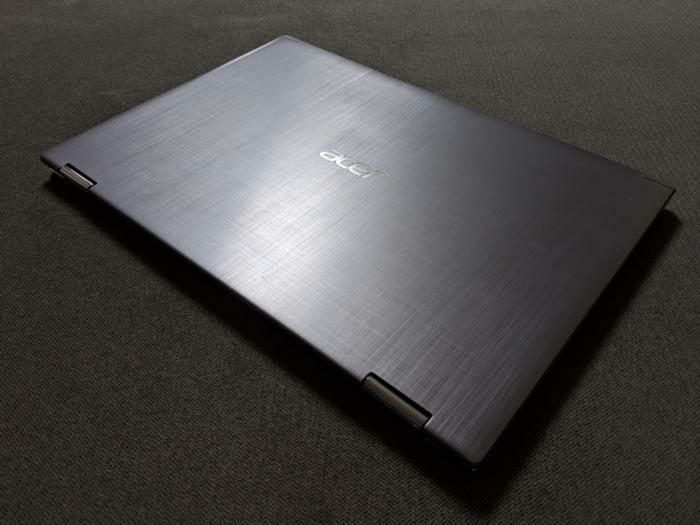 The Acer Spin 5 is a decent laptop. It's worth considering because of its good selection of features for the price, especially when it comes to connectivity and the quality of the keyboard and trackpad. On the downside you get merely average performance for the specs, an overly loud and uncomfortably warm fan, and a somewhat outdated design. The Alexa integration is interesting and wouldn't hurt if you were already deeply committed to the Amazon ecosystem, but it's a minor selling point.